Abusive behaviour from motorists and drivers failing to stop are just some of the problems faced outside school gates in West Sussex. But a scheme to equip lollipop men and women with body-worn cameras has seen the behaviour of drivers around schools ‘significantly’ improve, according to West Sussex County Council. The cameras, which were first used at schools in the area in spring, 2016, are worn across the chest to capture video and audio footage of any motorists driving in an antisocial manner or being abusive towards patrols as they help children and parents across the road. If footage of an offence is captured, it is passed to Sussex Police to consider as evidence for possible prosecution. The council installs temporary signs at school crossing sites to warn motorists that body-worn video cameras are in operation. “The result is that drivers’ behaviours are significantly improved,” the spokesman said. West Sussex County Council’s school crossing patrol team, working in conjunction with Sussex Police, has been encouraging schools to use the equipment. Across West Sussex there are now 14 school crossing patrols using the cameras. 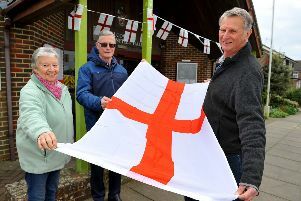 This includes four in the north of the county – which includes East Grinstead, Billingshurst and Haywards Heath, seven in the west – which includes Southwick, Shoreham and Worthing, and three in the south – which includes Littlehampton, Barnham and Aldingbourne. Since the cameras were first used in 2016, footage has been passed to Sussex Police’s Operation Crackdown on 11 occasions, the council spokesman said. This includes six occasions in the north of the county, two in the west and three in the south. While the county council provides training, ongoing support and temporary signs at the school crossing sites, schools generally purchase the cameras themselves, the spokesman added. However the council has been working in partnership with a charitable organisation, The Ellie Thornton Foundation, which has made camera donations to schools, and one camera was funded by a local council. The first school in Worthing to purchase a body-worn camera for its school crossing patrol was the Thomas A Becket Junior School in Glebeside Avenue. Since June, 2017, the camera has been used at the crossing in Wiston Avenue to help monitor parking, driving and attitudes of road users. A spokesman for the school said that, according to lollipop man Terry Rickards, the body-worn camera had been ‘a real deterrent for inconsiderate drivers’. The county council spokesman said: “The Thomas A Becket Junior School scheme was the first in Worthing in 2017, and we regard this as a huge step forward. Harlands Primary School in Penland Road, Haywards Heath, was another of the first schools in the county to use the equipment. Jane Goodlace, headteacher at the school, said: “Harlands School is located on a steep hill with heavy traffic passing through at peak times of day when the children cross the Penland Road. “To support the safety of our children, Harlands School purchased a body-worn camera two years ago to be worn by our school crossing patrol. We were amongst the first in the county to pilot this scheme. “It has proved to be successful in deterring some dangerous driving and antisocial parking, but most successful in providing evidence to the police of extreme incidents where there have been near misses with cars refusing to stop or failing to pull up in time. “Thankfully accidents have been avoided by the swift actions taken by my crossing patrol. However, Mrs Goodlace said the school was currently without a crossing patrol after their ‘highly valued’ lollipop lady left two weeks ago and was waiting to hear from the county council about a replacement. She said: “We are extremely grateful to a volunteer parent who has stepped into the breach temporarily but only employees of West Sussex Traffic Management are authorised to use the camera. West Sussex County Council has issued the following advice to motorists around schools. A spokesman said: “Please give our school crossing patrols consideration and assistance. • Wait until the patrol has returned to the pavement before moving off.